Today I took a trip to the Addison Gallery of American Art and saw a few of my favorite artists which is always an inspiration. 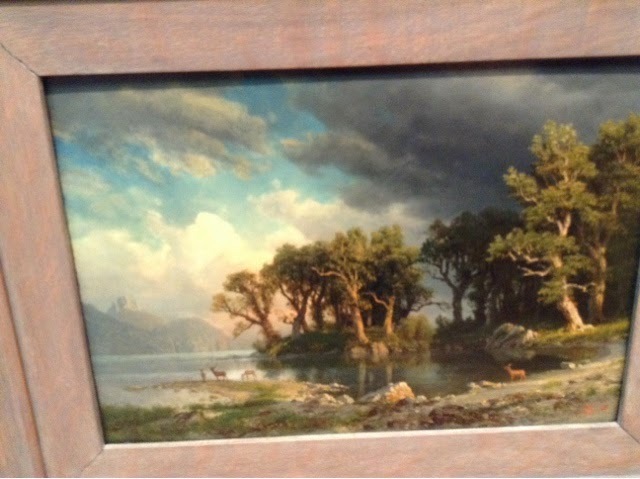 Winslow Homer, Albert Bierstadt, George Inness and Sarah Surplee all amazed me with their handling of paint. 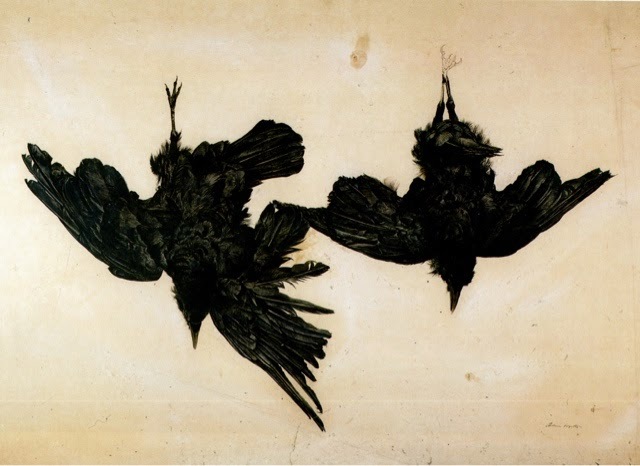 I had never seen Sarah Surplee's paintings and felt as if I had stumbled across a soul mate. This highway was Rt 495 in Massachusetts were I have painted myself. It is wonderful and humbling to find other artists that have worked in the same vein. 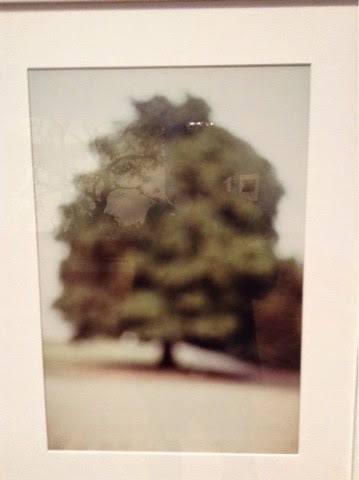 Here is a photograph of a tree by David Armstrong that reminded me of paintings of trees that I have done. This summer I took a trip to the old Lyme are colony and the Florence Griswold House. I wish that there was some places like this that still survive. Rome and board was only a dollar day! These communities helped artist development as they went out and painted together. 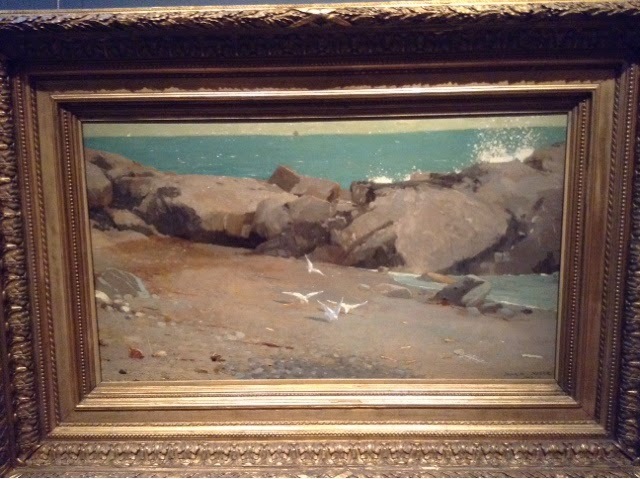 Childe Hassam and Willard Metcalf were two of my favorites from the group. "May Night" by Metcalf is a haunting picture. 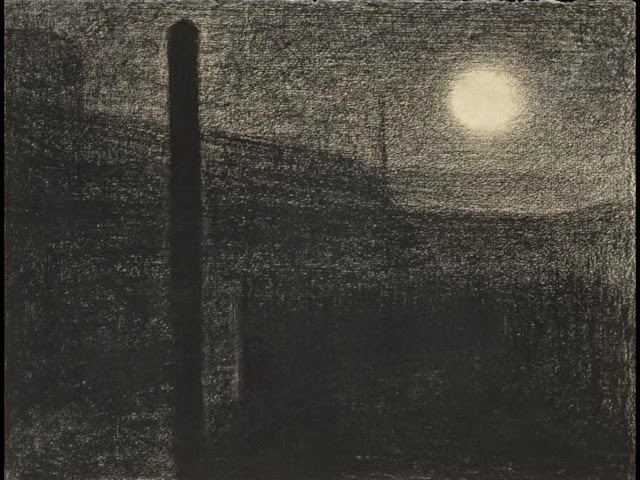 I love nocturnes and am always surprised when I see them as if the American Impressionist were not "allowed" to paint so dark. 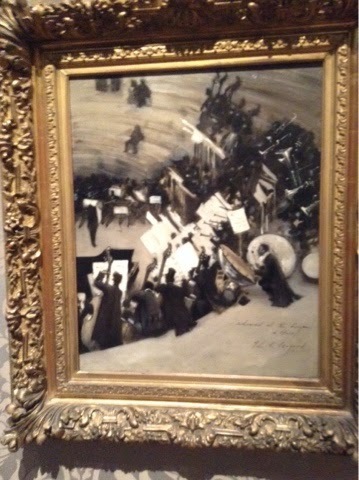 Willard Metcalf painted 26 paintings there In one year. 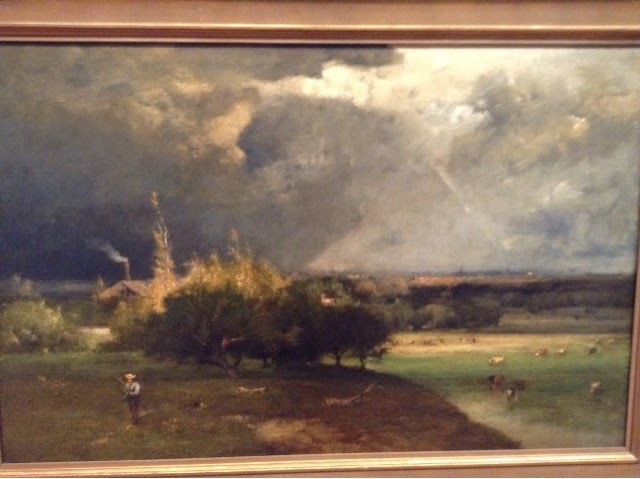 The subtle harmonies are reminiscent of my favorite Tonalist painters George Inness and James McNeil Whistler. 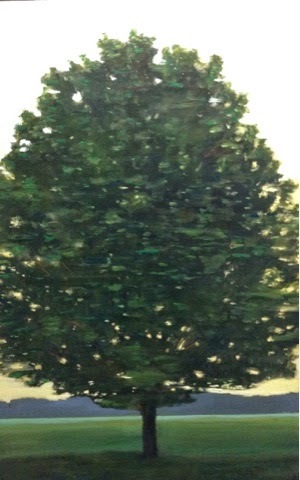 I was in Old Lyme showing a few Central Park paintings at the Old Lyme Art Association. 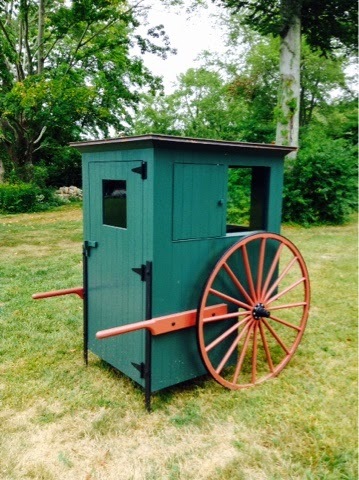 This was one of the first in the country. 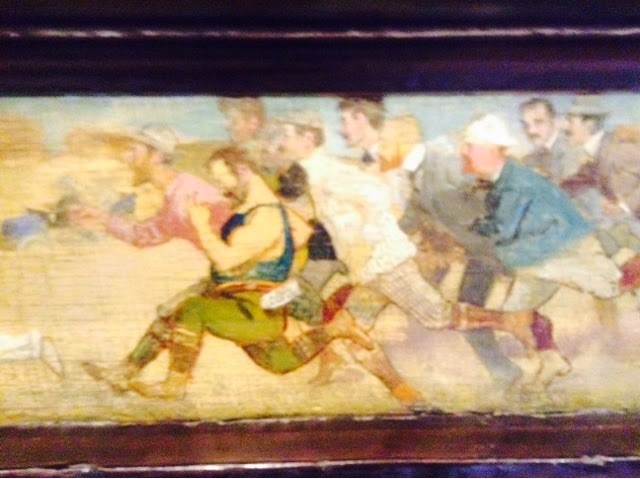 Incorporated in 1914 but artists began showing at the Library in 1902. 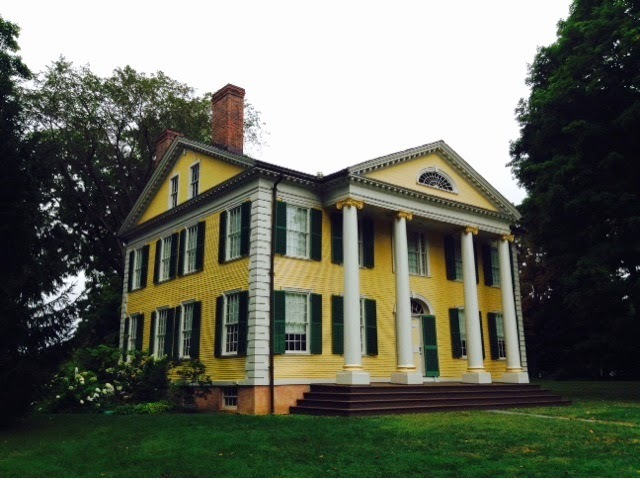 Griswold House. My Aunt Bonnie MacAdam used to work here before she went to the Hood museum in Hanover. NH. 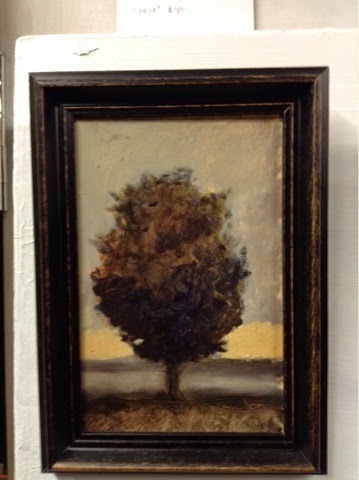 I had a few paintings showing at the Art association next door. This past fall I took a trip to the MFA with the family. We mainly went to see the Goya exhibit, but there is always the temptation to try and take in more than we can handel. They Goya paintings were sad and made me feel as if they were half in a dream and half in a nightmare. 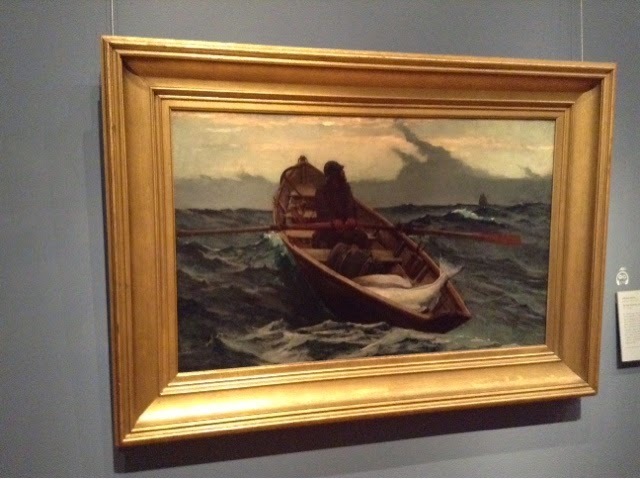 This painting by Sargent is always a favorite. After seeing it I always hope to do some paintings of musicians. The Winslow Homers in Boston are also really beautiful. The way the ocean is painted is amazing and memorizing. You can really feel the movement of the sea as the waves are coming in. I get tired just looking at this fishman and his catch with no land in site. The suggestion is always more powerful to me then the spelled out every blade of grass kind of thing. 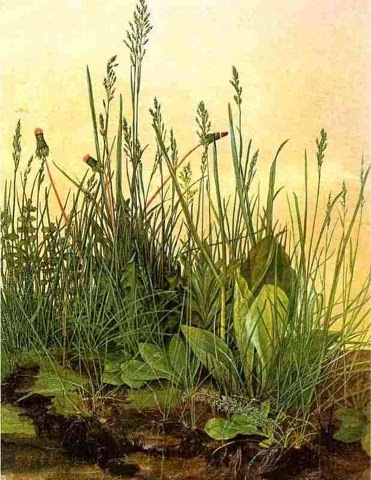 Although I think of Albrecht Dürer's watercolor "Great Peice of Turf," might balance that aesthetic. This painting has always impressed me. The love and care that went into studying a few square feet of earth is admirable. I think of Anne Dillard and her writings and observations in "A Pilgrim at Tinker Creek". She takes us under the earth and loves every part of it and analyzes each part. She even goes so far as to imagine sculpturing a tree with all its roots! How much material wood it take to recreate. A birch tree or a red wood for that matter. It could take one person a lifetime. 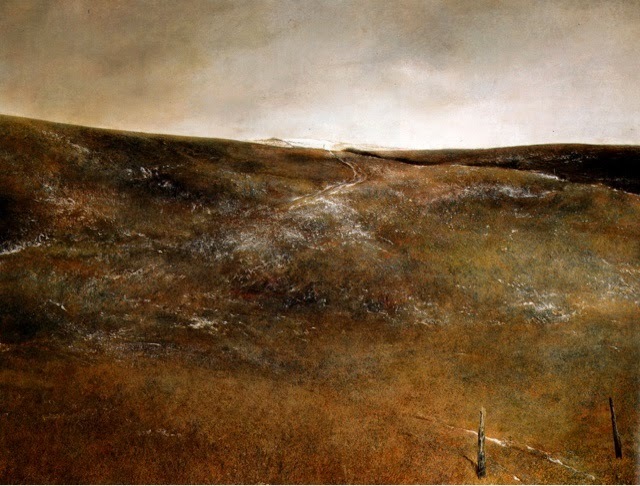 Andrew Wyeth has the same attention in his studies of nature. I compare the two here. 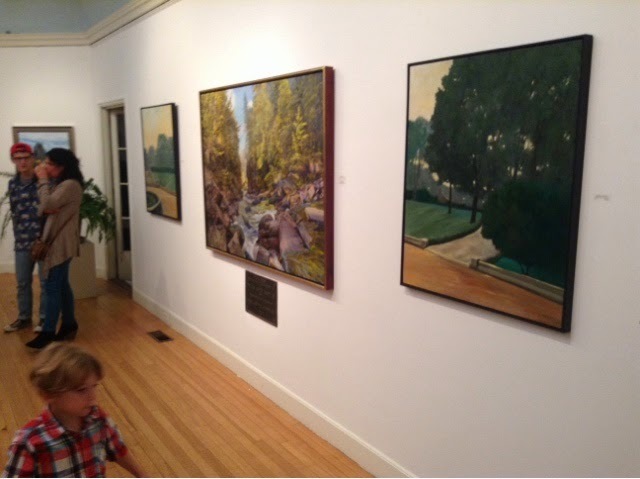 I also really enjoyed the Jamie Wyeth exhibit that they had there. For me Andrew Wyeth is one of the more interesting characters. 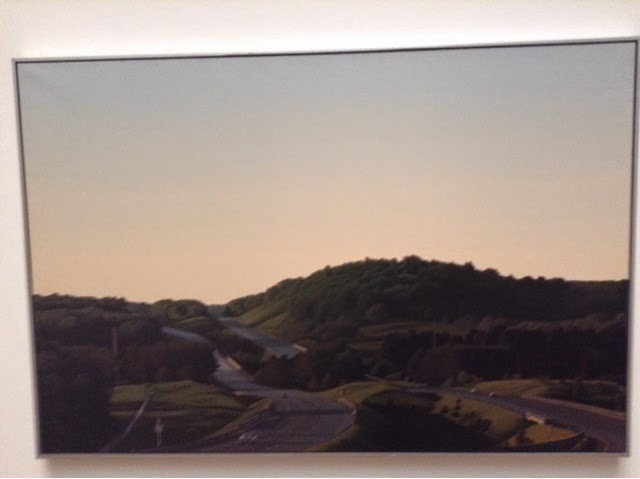 This painting stikes me as so vast. He is like a space junkie. David Hockney used the phrase to cat agonize himself and I see it fitting for Wyeth as well. Our brains can't really fathom space. When it comes to a field, the Grand Canyon or the Milky Way and beyond. It all depends on the size to of the viewer. If you are an ant the tuft of grass is your world or yard. The field Weyth painted is your world. 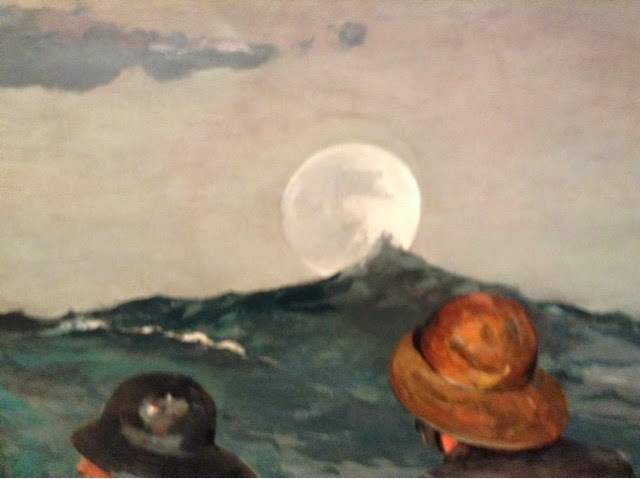 Cezanne was Abel to paint the air that is closer to us and the air that is further away. 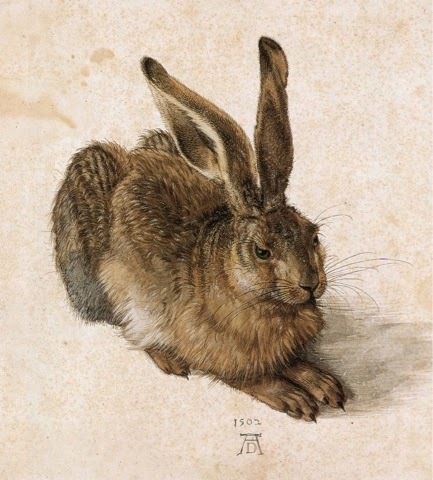 The artist here takes nothing for granted. Jamie's paintings seem a little more illustrative at times like his grandfathers. This is fine with me. I love a good story. 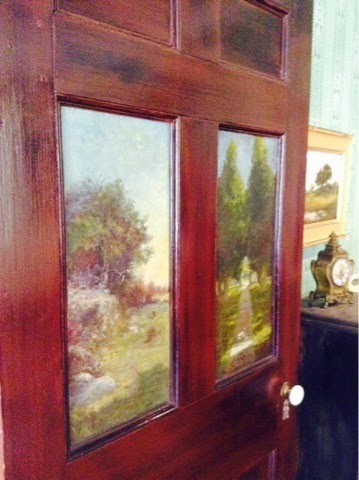 Here is a painting that was used in the HBO movie Olive Kitteridge. I have not seen it, but know it was shot on the North Shore. Living on the North Shore of Massachusetts I was reminded of thd landscape of England. Some of the open fields and salt marshes reminded me of Sudbury in Suffolk. There I could see great distances. Inland there were so many trees. Out on the coast I am able to see the horizon and watch the effects of light as it comes down over greate distances. 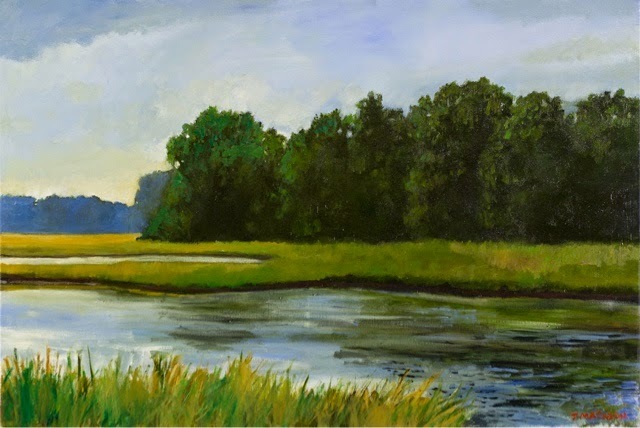 This painting was started from a smaller study that was done near thd Parker River in Ipswich, Massachusetts. The family all got out and stretched while I painted for an hour. My family is so patient. 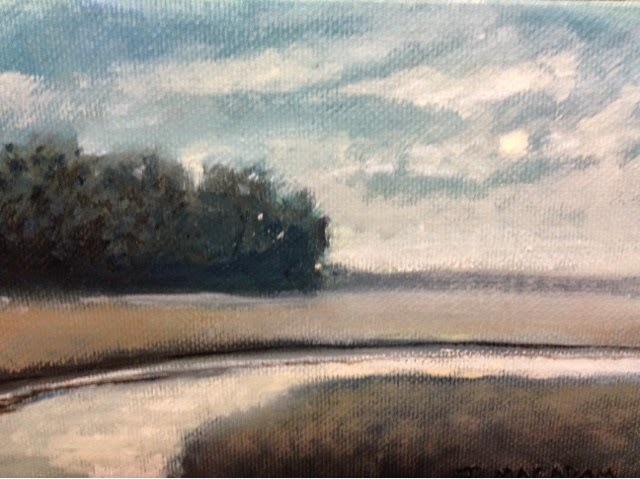 Later I took the small painting back to the studio to make "Summer Marsh." I hope to see the movie. Sometimes I feel as if I like a movie just because of the locations or the sets. A few years back I made a series of paintings in Central Park, New York. I really enjoyed bring there. It is a wonderful place to get away. At the se time is is really nice to people watch. 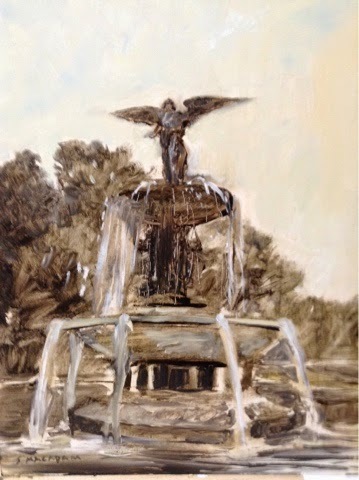 The painting above is a grisaille of Bethesda Fountain. 14x11 inches. 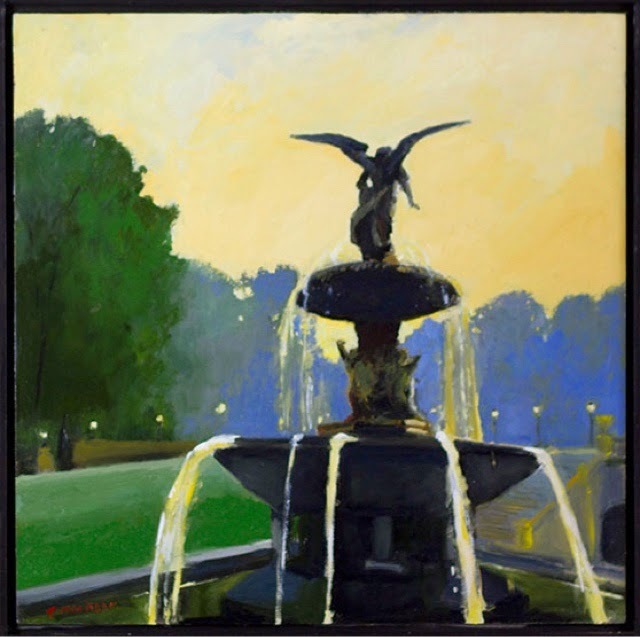 I painted the fountain a few times at different angles. This grisaille is on of my favorite as it is a quicker sketch. I enjoy these simple studies as they feel more like snap shots or gesture drawings that get closer to the subject that s more finished painting could. 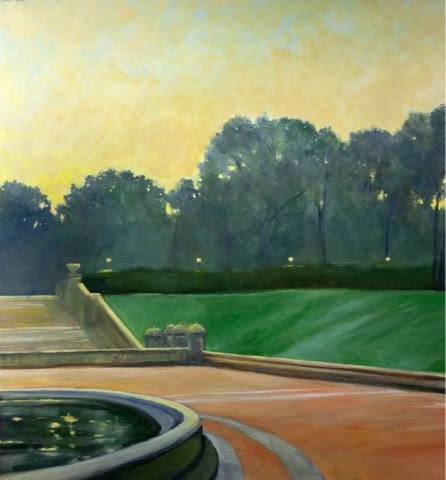 Below is the 18x18 finished painting that went into an apartment that over looked the south west part of the park. The painting below is looking toward the stairs and was done closer to the evening. They were shooting a movie so there were lots of extra lights. I have been painting some moonlight studies this past month. I am using 5 x 7 panels. Usually I first cover them in orange or ocher and mix it with liquin. This creates a nice ground to work on rather than white. What I like about the small studies is you can take a quick idea and instantly have something. 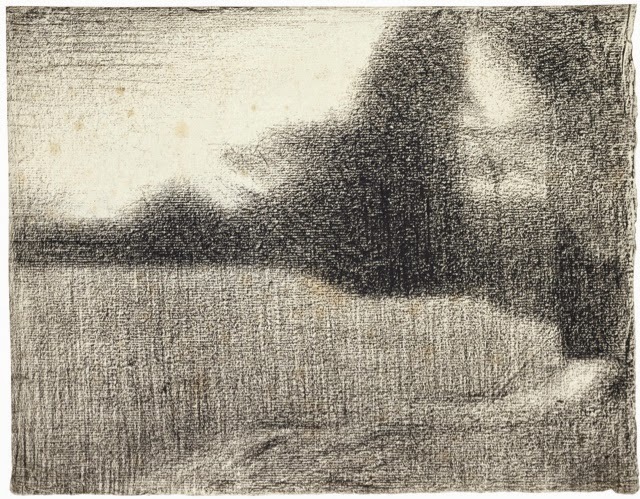 I was first inspired by George's Seurat drawings. They were interesting in that they didn't spell everything out. They have a warm glowing feeling for me. The light of the paper hovers around the forms. I made a series of paintings in where I painted the panel blue and the put a layer of black over everything. I then used sand paper to get through to the blue. The process was time consuming and hard labor but the results gave evidence to this fact. It was more reductive and felt a little like sculpture where I would be surching the form. 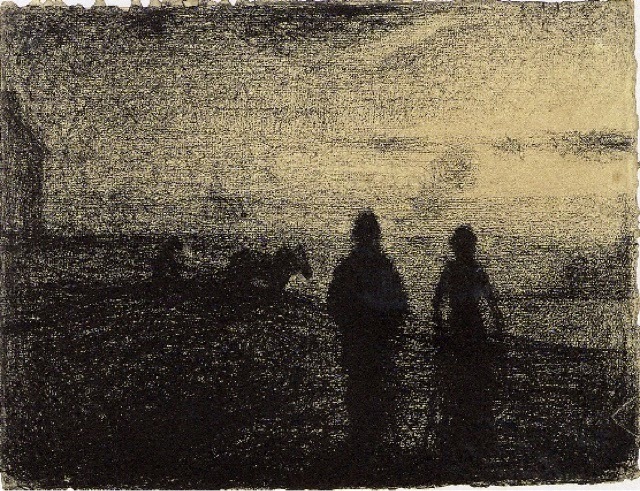 In these drawings I am drawn to the way in that light makes its way through darkness.